A subject that I find myself reading about and discussing over the dinner table a lot recently is the promise of self-driving cars. I absolutely love the idea because of all of the problems it can solve in society. No more drunk driving, no more wasting time in traffic jams, no more parking issues and no need to own an expensive heap of metal that looses value even though you only use it a few hours a week. 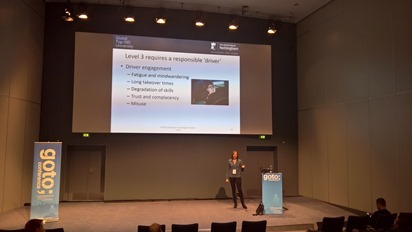 With this in mind I went to Sanna Pampels talk called “Automated driving - are we taking the human factors researcher out of the loop?”. The talk was relly good with Sanna starting out by covering the different levels of automation. Going from a level 0 with no automation, over different levels of assisted and partially automated driving to level 5 which is full automation or autonomous cars. Sanna said that british drivers spend 124 hrs in traffic jams each year, and dribing is not as safe as it could be, mainly because of human errors in traffic. Automation is already happening, and we have today reached level 3 in tesla cars that can drive on its own on the motorway. Accidents have already happened at level 3, which research shows is because the process of takeover and handover is quite slow. In tests it is shown that takeover often takes up to 15 seconds, because the driver quickly starts trusting the automation, even in cases where the driver reported to be a sceptic when getting into the car. Google cars which are somewhere between level 3 and 4 has recorded hundreds of handovers recorded where they are being tested. So this speaks to us maybe focusing on the end goal of level 5 and autonomous cars, which is where ideas like shared ownership, and other types of cars also come in. Full automation is a different ballgame, that requires machine learning and deep learning techniques. It quickly turned out that there are a number of issues to adress in this space as well. First of all an accident has already occurred because a cars started learning bad habits from human drivers. Still Tesla announced that they expect to have the first self driving cars out by 2018 and Ford expect them by 2021. Some of the things that we need to solve to make this real are what the driving experience shoud be like? What can non-driving activities be? How do we ensure people both inside and outside the car trusts the technology? What do we do with reguard to ethical decitions like what to in a situation where you have to choose between driving into someone else of crashing the car? How do we change legislation? There are lots of questions that we need to discuss and make decitions about. Espects that I also found interesting is that some might not want self-driving cars because they enjoy the driving experience, and the fact that there are cultural differences to how we expect cars to be driven – so should a car drive like a human and learn the wishes of the owner, or should it drive like a machine? To some extent dissapointment is inevetable, but the promise is simply too big for us to ignore, so even though we don’t have all the answers, we live in an exciting time and it will be interesting to see where these technologies take us.